Dutch designer Saif Siddiqui, has come to the rescue of people who don’t like getting their pictures taken. 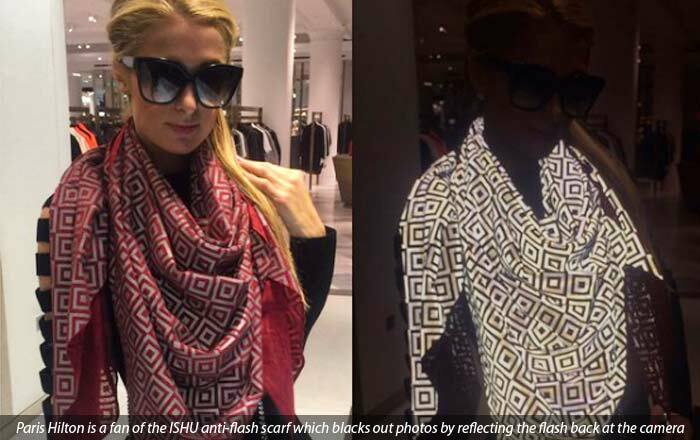 Presenting the ISHU, a ‘paparazzi-proof’ scarf which makes the wearer invisible in photos. This clothing accessory is created from a special fabric infused with thousands of minuscule particles which reflect light from a flash unit back at the source. It’s one of those simple but genius concepts that can change the world. Of course, we’re talking about the world of celebrities and flash photography here. Because the ISHU scarf costs a hefty £289 (about $383 or Rs 25770), a precious chunk of money for ordinary mortals like us. Siddiqui got the idea way back in 2009 when clicking images of his friends standing in front of a bike whose reflector obscured the faces in the photo. The scarf can work its magic only if the concerned camera’s flash is being used, which is most of the time when celebrities are being photographed. It blacks out images by throwing light back at the lens, the end result showing up like some sort of negative. The type of understated, graphic print on the ISHU ensures that it can be teamed with various kinds of outfits. Plus it’s available in three color options of red (£289), black (£355) and gray (£199 and sold out presently). Want a piece of this cool wizardry at a lower price? Siddiqui has also rolled out an ISHU case for Samsung Galaxy Edge and iPhone 6 devices at £60. It’s up for pre-order currently. Then there’s the ISHU tie and pocket square combination for £70. Head over to the ISHU web store (link below) if you fancy any of the accessories we’ve mentioned.